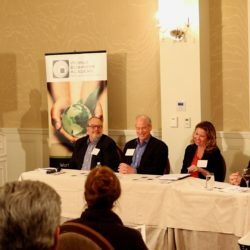 The Academy’s February 20th Global Citizens Club meeting Rebuilding Montecito: Pathways to a Resilient Future explored resiliency on a personal, community, and countywide level as we addressed the rebuilding of a community deeply affected by climate change. Following the Thomas Fire and Montecito landslides, we need to pursue solutions for a more resilient electrical grid and infrastructure that can withstand the ever-increasing instability of our climate. Each member of the panel, moderated by World Business Academy founder Rinaldo S. Brutoco, touched on a unique subset of resiliency. Speakers and panelists included First District County Supervisor Das Williams, Jina Carvalho of the Glendon Association & Santa Barbara Response Network, Charles Newman of the Montecito Planning Commission, Jennifer Cregar of the County Division of Energy & Sustainability Initiatives, and Craig Lewis of the Clean Coalition. The meeting, while addressing the aftermath of an awful tragedy, had a positive energy that inspired all attendees to think critically about what we must do moving forward, and how we can rebuild our communities in a strategic, innovative way. We here at the Academy firmly believe that a community microgrid is an essential component of a more reliable, resilient, and renewable Santa Barbara. The World Business Academy and the Clean Coalition have partnered to create a community microgrid for Montecito that would establish areas of energy stability within the town in the event of another natural disaster. Craig Lewis presented on this joint project and explained how a microgrid could withstand potential grid disruptions during disasters like the Thomas Fire and Montecito landslides, while presenting maps of Montecito’s potential solar sites that have been developed in collaboration with the Academy’s Director of Research, Robert Perry. According to Lewis, establishing a Montecito microgrid would cost after federal rebates and tax credits as little as $3 million. In addition to the proposed Montecito community microgrid, the Academy has been working actively with other regional allies on a community microgrid alternative to the proposed Puente natural gas peaker plant (which was rejected in October by the California Energy Commission). The Academy has been pursuing clean energy and the establishment of community microgrids with its SBR3 program over the past four years. We believe that community microgrids, based on renewable energy resources and investments in hydrogen storage, are the key to the Clean Energy Moonshot- a 100% renewable California in 10 years or less at no additional cost to the ratepayers. In conjunction with the Clean Coalition and other community allies, the World Business Academy sees this tragedy as an opportunity for a resilient renewal of our local energy system, and encourages Montecito to become a leader in local renewable energy generation. You can watch a recording of the meeting here.